Since we first published this guide a year ago, we’ve noticed only one new baby clipper on the market worth checking out. But this clipper still doesn’t compare to our original choice, the Safety 1st Sleepy Baby Nail Clipper, which still remains a safe and cost-effective choice. Many first-time parents are terrified of cutting their infant’s tiny nails. What if I draw blood? Luckily, a good nail cutter can take all the fear away. If I were buying a nail trimmer for my baby today, I’d buy Safety 1st Sleepy Baby Nail Clipper because it cuts tiny nails safely at a reasonable price, and has just that something extra to make it stand out. We tested the top-selling baby nail trimmers on the market today on an infant’s fingers to see which pair was safest, easy to use, and high quality. Besides consulting with a number of parents who have been through the newborn/infant stage to get their views on preferred trimming techniques and favorite products, we also consulted with top pediatrician Jennifer Shu and researched the views of other experts from sites such as BabyGearLab, Babble, and Parenthood360. 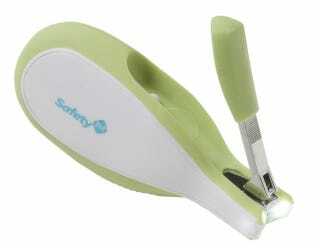 We found that Safety 1st Sleepy Baby Nail Clippers was consistently a top choice. What Makes A Good Nail Trimmer? There are a few different methods for trimming baby nails. Sure, there’s nothing less expensive than your own teeth for cutting nails, but on the other hand, you don’t need to invest in a battery-operated nail trimmer that requires replacement pads. There are cheaper options out there that work just as well. But before you go and buy the first grooming kit with clippers that you see, it’s worth learning what separates a good nail trimmer from a bad one; ease of use, safety features to protect against nicks, and lasting quality that can be used into the older baby/toddler years all matter. Oh, and of course, a reasonable price. Our criteria for deciding what was a deal-breaker for a product included: difficulty when used on tiny fingers; products that don’t last or break easily; and of course, expense. In our research, we found that the baseline cost was around $4 to $5. Over $10 and you’re only getting a brand name or electronic widgets that you don’t need. To find the best product, we weeded out trimmers that didn’t fit our bill of must-have features. We scoured the Internet for both bad and good reviews of trimmers to find the top choices online, and spoke to groups of moms to find out what they liked and disliked in a nail trimmer. The products with great reviews got a closer look from us. We had the mom of an infant and a toddler try a number of the top-selling trimmers on the market on her younger son. She had been a big proponent of biting newborn nails in the past, and had also used the simple clippers that were part of a Red Cross grooming kit. As an experienced mom open to trying new ways of cutting her younger baby’s nails, we trusted her take. In terms of different styles and parental trimming needs, Safety 1st virtually owns the overall market with a wide range of products, many of which are consistent best sellers. The brand offers 6 types of clippers, available in different sets and on their own. When I visited various stores in my area, the shelves were stocked (overwhelmingly so) with Safety 1st trimmers. And it turns out, rightfully so. 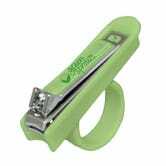 When it comes to picking the one item that’s going to make it easy for clipping those tiny newborn nails as well as transition well to older infants, we pick Safety 1st Sleepy Baby Nail Clippers. Our mom tester found that the clippers were easy to use, didn’t nick her baby’s fingers, and was pleased to discover the added LED light actually made a difference. Admittedly, we do not believe a lighted nail clipper is necessary to get the job done well. In fact, in many cases, a simple nail file might be all you need. However, what drew us to this product was that for a low price you get a quality trimmer — plus, the light seemed to be a nice added bonus, when you could spend equal for one without that feature. The light made cutting very small infant nails easier to see clearly in all sorts of lighting; we tested in daylight, dim indoor lighting, and during the evening. One tip popular amongst experts, such as Jennifer White of About.com and Dr. Jennifer Shu, is to cut your baby’s nails while they’re sleeping. The Sleepy Baby Nail Clippers seem to be made for this purpose, hence the name. The LED light means a parent doesn’t have to turn on a lamp and risk waking the baby up. As an added unexpected bonus, the infant we tested on enjoyed looking at the light and did not squirm with these clippers as opposed to others tested. So these clippers have actual entertainment value for some youngsters! In fact, the mother’s toddler also enjoyed looking at the light while having his nails clipped. Additionally, the sides of the Sleepy Baby Nail Clippers feature curved cutting edges, designed as a safety feature, which fit well around infant fingers. The price is right. At just $4.99, the Safety 1st Sleepy Baby Nail Clippers were reasonably priced and even less expensive than some scissors and trimmers that didn’t offer any extras such as the light. One thing that isn’t great about the Safety 1st Sleepy Baby Nail Clipper: the nail file doesn’t stay in its built-in slot very well. 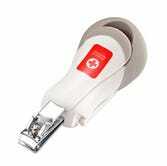 It’s easier to just use the file on its own than in its special holder on the clipper. Perhaps in its next iteration, the slot for the file can either be nixed or fixed to hold it better so it doesn’t move around loosely. While we ultimately decided that the Safety 1st Sleepy Baby Nail Clipper was our pick based on its price, quality, and unique features, we have to say we also really liked the Piyo Piyo Baby Nail Scissors. These durable stainless steel scissors seemed to be virtually nick-proof on even the smallest fingers. The price was also reasonable, and the scissors felt like high quality in our hand. Ultimately, we felt that the Piyo Piyo scissors would be a little harder to use as your baby gets older and moves into the toddler stage, as it may require multiple cuts to get the whole nail tip. 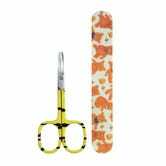 But if you prefer to use scissors over clippers and decide to go with the Piyo Piyo Baby Nail Scissors, you will definitely be happy with the quality, safety, and ease of use. We considered these alternatives from manufacturers, but don’t consider them to be a top choice. Tweezerman Baby Nail Scissors The $22 price tag is unnecessary for giving baby a good manicure — spend the money on your own nails. Safety 1st Clear View Nail Clipper As our mom tester said, “Looking through the magnifying lens makes me feel drunk; not what I want while cutting my infant’s nails!” Other reviews agreed, saying that they couldn’t get a steady view because baby kept wiggling. 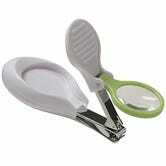 The First Year’s American Red Cross Deluxe Nail Clipper with Magnifier This one has the same issues as the one above. Nuby Infant Nail Clippers Basically just a tiny-size version of adult clippers with a cute design. They cost the same ($10) as some of the more popular Safety 1st clippers that have little extras in their design. Baby Comfy Care Deluxe Safety Nail Clipper—This newer-to-the-market clipper is supposed to make it practically impossible to nick baby thanks to a single blade and a design that holds baby’s skin back. The problem is it’s also nearly impossible to cut the nail. It takes a lot of little snips to get across a tiny nail when we prefer just getting the job done in one cut. The $15 price tag just isn’t worth it; it’s large size is awkward to hold as well. As Dr. Jennifer Shu says, “the real purpose baby nails serve is to break you into parenthood. They will likely require trimming or filing at least once a week because long nails on the hands of newborns with little to no control of them predictably result in stray scratches.” You’ll want to cut your baby’s toenails about once a month on average. Besides cutting nails while your baby is sleeping, many seasoned moms have suggested cutting them while feeding. Basically anytime your baby’s hands aren’t busy flailing around is a good time! One thing about clippers — it’s hard to replace any parts. Your best bet is to just buy new ones. We think the Safety 1st Sleepy Baby Nail Clippers will last a long time thanks to the sturdy stainless steel, but if they don’t, the low price point won’t leave you grousing about having to buy more. With a decent price for safe clipping, plus an LED light that makes trimming both infant and toddler nails more simple, our choice is Safety 1st Sleepy Baby Nail Trimmer. The quality means you should be able to keep this one in your kit for years to come — if you don’t lose it first! If you enjoyed this guide, find more at TheNightlight.com. The best baby gear—tested, tried, and true.